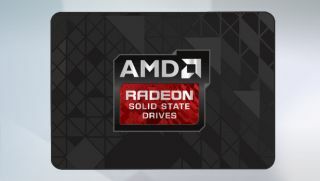 As expected, AMD will launch a new range of SSDs in partnership with Toshiba's OCZ Storage Solutions, and the Radeon R7 will be available in 120GB, 240GB and 480GB capacities. The move comes three years after AMD launched a memory range aimed at the same gamer enthusiast audience. As expected, AMD won't manufacture the SSD, these are merely rebadged models with specific AMD Radeon branding, finetuned in order not to compete with the rest of OCZ's portfolio. The Radeon R7 sits between OCZ's Vector 150 and the Vertex 460 series; the first one is aimed at a professional audience while the latter targets everyday users. While they use the same flash component and display roughly similar read/write speeds, their endurance varies significantly. The 150 series is rated at 91TB (50GB per day for five years) while the R7 is just under half of that, and the 460 series barely hits 22GB. The 120GB version of the Radeon R7 has a suggested retail price of $99.99 (about £60, AU$110). Expect online prices to be significantly less, in line with the rest of the competition, and the R7 SSD to be offered bundled with graphics cards or AMD motherboards.